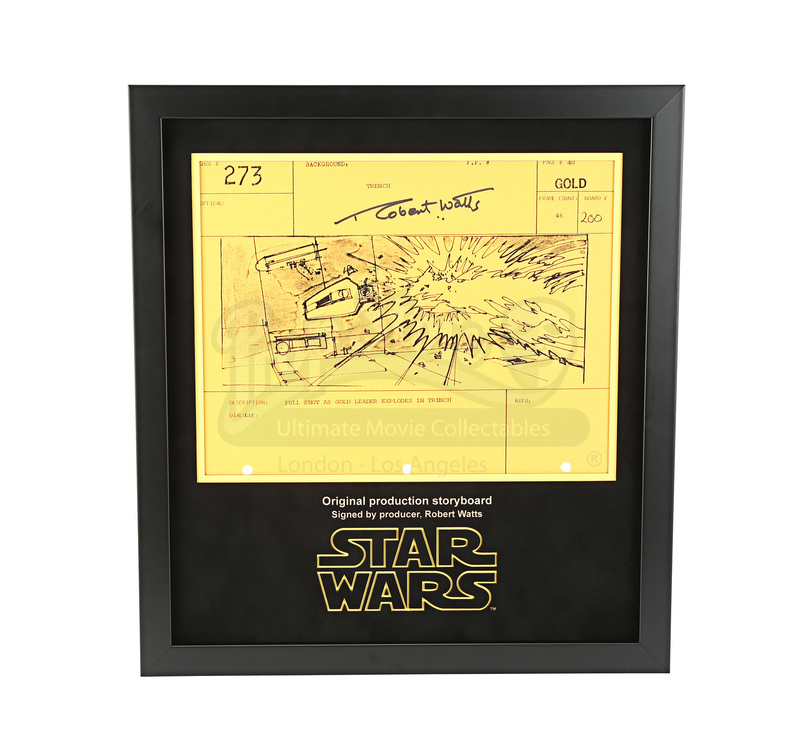 A signed original production-used storyboard from the first movie in the epic George Lucas saga, Star Wars - Episode IV: A New Hope. 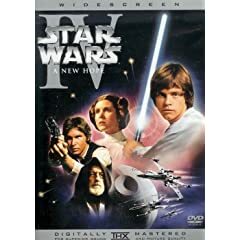 This storyboard came from a complete set created for the visual effects sequences, which included everything from miniature ships in the sky to the rotoscopic effects of lasers firing from the Death Star’s gun turrets. 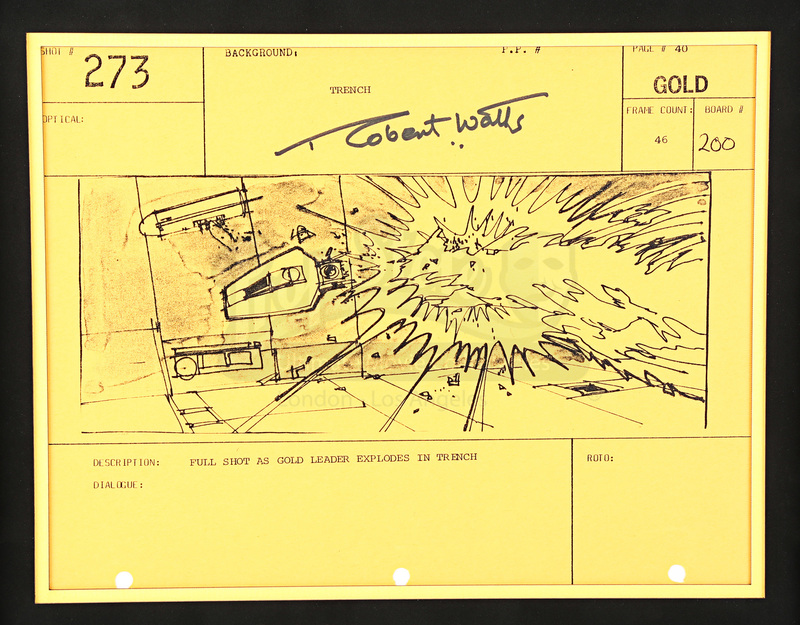 This storyboard shows a full shot of Gold Leader, Jon ‘Dutch’ Vander’s (Angus MacInnes) spaceship crashing into a ball of flames. Beneath the image are the words, ‘FULL SHOT AS GOLD LEADER EXPLODES IN TRENCH’. The storyboard is labelled as shot “273” and is printed on a sheet of yellow-coloured paper and hole punched at the bottom from where it was grouped in sequence. 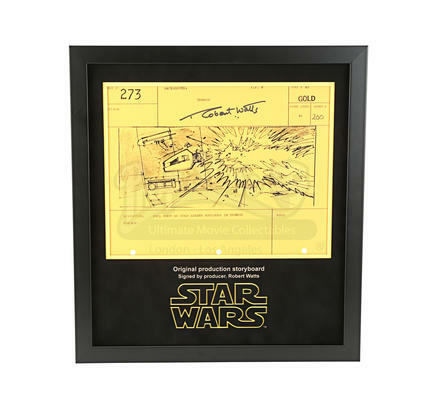 This implies that this individual storyboard was part of a comprehensive shot by shot miniature version of the movie’s spectacular and ground-breaking effects. This piece has also been signed by the legendary veteran producer Robert Watts who also produced the Indiana Jones trilogy and Who Framed Roger Rabbit.